Among the thousands of men who fought in the Australian Imperial Force (AIF) in the Great War were many recent émigrés from the UK, including young Londoners who had gone out to the Dominion in the years before 1914. One of these was Francis Paget Hewkley, who left London for Australia in June 1912 and wound up at Gallipoli before being killed in action on the Western Front. Hewkley was born in Stoke Newington in March 1894, the son of medical practitioner Dr Frank Hewkley and his wife Dorothy. He was still in education in 1911; he attended the Merchant Taylors’ School and served in their Officer Training Corps. He was then living with his parents and sister in a large house (with 6 servants) in Lower Seymour Street, Marylebone, W1; the next year he left all that behind to work as a clerk for the Bank of Australia in Western Australia. He was about 5’6” tall, with fair hair. 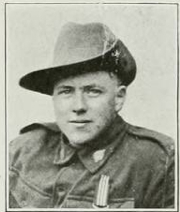 During 3rd, 4th and 5th September 2nd/Cpl Hewkley showed great gallantry and devotion to duty in mending and laying telephone lines from POZIERES to Battalions [in the Division]. During the night 3rd and 4th […] he went out 4 times and mended breaks in telephone lines under very heavy fire. In late June 1917, the Division took part in the attack on Zonnebeke Ridge, with the signallers maintaining the communications – mending and laying lines to keep the infantry, artillery and commanders in touch. On the first day of that attack (26 June), Hewkley – now a sergeant – was wounded by a shell fragment near ‘Tokio Ridge’ just in front of Zonnebeke (visible at the back of this photo). As he was being brought to a dressing station, he was hit by another shell (according to some reports, this shell killed his stretcher bearers) and was taken to No. 2 Canadian Casualty Clearing Station at Remy, where he died 8 hours later from wounds to his left shoulder and skull. He was buried in nearby Lijssenthoek military cemetery. His parent’s outlived him, their only son, and he is also commemorated on their shared headstone in Brockley and Ladywell Cemetery in South London, near their postwar home in Wickham Road, Brockley. Francis Paget Hewkley really did do his duty to the end, with great bravery even at the cost of his own life. The Big Push on the Somme in 1916 was greatly anticipated back in London. Its first physical manifestation, though, was the flow of wounded servicemen flooding back through the capital’s railway stations. The flow of wounded from the Battle of the Somme began almost as soon as the battle itself, with trains full of casualties arriving in the first few days of July 1916. Hodgson Lobley’s painting captures the scene as the wounded from the battle arrived at Charing Cross. 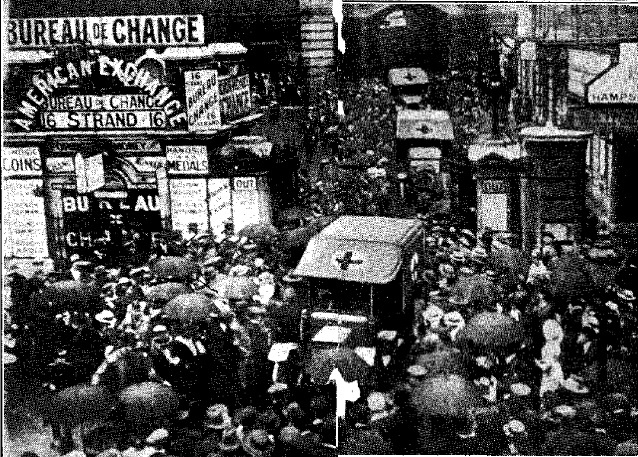 A picture published in the Daily Mirror on 4 July suggests that the crowds were slightly less orderly, but also shows the interest taken by the crowd in the arrival of these casualties of war. 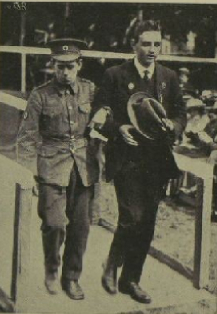 Pathe’s film archive also shows a similar arrival of wounded servicemen at Charing Cross, possibly also that summer. In June 1917, a large crowd gathered for a ceremony in Hyde Park where the King awarded medals to hundreds of men and women. George V paused during the ceremony for a longer chat than usual with one London veteran, Albert James Mason, who had been blinded during the Battle of the Somme the previous autumn. The crowd that gathered in Hyde Park on 3 June 1917 saw over 300 servicemen and 12 women awarded medals for gallantry and good work during the war, along with 50 relatives of those who had died since or during their actions. A murmur ran through the round…, for an orderly was leading a blind man to the King’s presence. It was Corporal Albert Mason, in mufti, for he is a soldier no longer, but he won the Military Medal when in the London Regiment. He was halted in front of the King, who spoke to him for some time and reached down and grasped the wounded man’s hand. The scene was a far cry from the battlefields of France, where Mason had earned his medal and suffered his wounds the year before. He had enlisted as a 19-year-old on 1 September 1914, at the peak of the recruiting boom, joining the Civil Service Rifles. His address was recorded as the Central London YMCA (the original YMCA) on Tottenham Court Road, but his widowed mother lived in Pietermaritzburg in South Africa; it is not clear whether he was a South African in London or his parents had moved to Natal before the war. Mason soon took the Imperial Service oath and joined the battalion of his unit that was due to go to France, the 1/15th Battaltion of the London Regiment. For some reason, he remained in the UK for a year while the unit was in France, only joining them on the Western Front in March 1916. That summer, he was part of that unit during the Battle of the Somme, serving in the 47th (2nd London) Division. It is not clear when or for what he was awarded the Military Medal. Although it was not formally awarded until December 1916, the divisional history and his service record give the date as 9 October 1916. Mason was promoted to Corporal on 15 September 1916, the first day of the battle of Flers-Courcelette, which saw the first use of and where the Civil Service Rifles were in the heart of the battle at High Wood. It may be that actions on that day earned him both his promotion and his medal. Supported by the tanks, the infantry were to attack the German lines without the benefit of a preliminary artillery bombardment, but the Civil Service Rifles found that their tanks were held up and arrived after the attack started. They and their London Division comrades were held up in no-man’s land, suffering casualties all the time, until additional bombardments cleared the German defences and the Londoners broke through to take High Wood – an objective that the British had been trying to take since July. The Battalion, and the Division, had suffered an enormous number of casualties in the attack; by the time they withdrew from the front line on 20 September the Battalion had lost 15 officers and 365 other ranks. We don’t know whether Mason earned his Military Medal at High Wood, or a few weeks later when he was blinded. The battalion had been filled up with hundreds of new reinforcements (which may explain Mason’s promotion, as a relatively old hand in the unit) and attacked the Butte de Warlencourt. In the afternoon of 7 October, the Division attacked the Butte, under heavy enemy bombardment, while the British ‘creeping bombardment’ crept on too quickly and the infantrymen were left behind. The attack was a failure. On 8 October, Mason was evacuated away from the unit with a gunshot wound in the right eye – probably either a bullet or a piece or shrapnel. After medical treatment at the front, he was transferred back to the UK at the start of November, and was discharged on medical grounds and with an excellent character reference in January 1917. Sadly, this is where his record ends so we do not know where he went or what he did after being awarded his Military Medal for bravery in the field. Albert Mason was just one of the Londoners flung into battle in the Battle of the Somme in 1916. His unit suffered heavily in both the successful attack on High Wood and the failed attempt to take the Butte de Warlencourt. In one (or both) of those two battles, Mason performed with remarkable bravery. Within days, though, he was blinded and his military career was over. The Civil Service Rifles in the Great War by Jill Knight – an excellent book, which I used for the descriptions of the battalions actions in 1916. The start of August 1914 was a time of great emotion in London. As we saw in the first post on this blog, there were a number of crowds in Westminster in the days before the war and on August 4th. The photo shows the scene after war had been declared and the King and Queen (George V and Mary) had come out onto the balcony, joined by their son the Prince of Wales (later Edward VIII), who had recently become an officer in the Grendadier Guards. They seem to be on the right-hand balcony (looking from the Victoria memorial) rather than the larger middle balcony used by George VI on VE Day and by the current Queen on big state occasions since then. Two things to note about this photo. 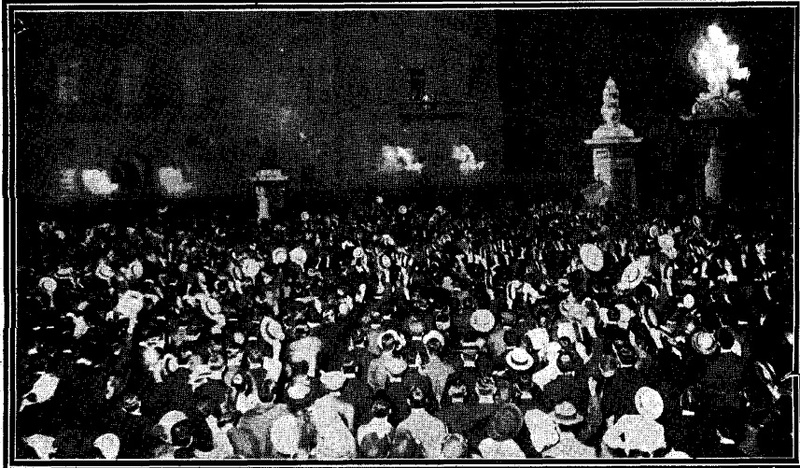 The first is that there really were huge crowds in Westminster late at night on 4 August 1914 to great the declaration of war. The second is (as noted in the earlier post about Trafalgar Square) the social make-up of the crowd: it is mainly a young middle/upper class crowd, as shown by the number of straw boaters being waved around. Hats were a handy way to identify men’s social class in 1914. The war was greeted with cheers by some, but more by young well-off men than by those whose jobs might be affected by the disruption of war or for whom providing for the family (as the bread-winner or the person shopping and cooking) would become much harder as prices rose in response to the war. It is unlikely that any Londoners really envisaged the kind of war that was beginning that night 99 years ago, but a great many greeted it with fear. Worried individuals and families do not make for exciting newspaper images and copy, though, so we are left with images of jubilant crowds.